Last week I shared one of my closet secrets - renting dresses & the fabulous new dress rental company Lendperk. I also told you that I'm not very good at "re-mixing" my dresses. Some of you said that you are dress styling masters (so jealous! ), while others fessed up that you are a one-&-done dress wear-er too (don't worry, you are not alone). So in the spirit of trying something new, I wanted to share with you how 1 rental dress can be worn 3 ways - seriously, you guys make me better! With Lendperk, you keep your rental dresses for as long as you like, so why not maximize your new wardrobe addition before sending it back!? 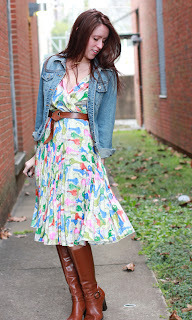 Using this colorful key print Anthropologie dress, I have created a whole weekend of looks. Look 3: going out on the town, date night style! Well you better start thinking about it, because YOU could win your very own unlimited month of dress rentals from Lendperk! That dress is so cute! I love the first way you styled it. Ohhh I love that dress! And all 3 of those looks are just amazing... I honestly don't have a favorite... Looking good girl! Eeek!!! Such a great giveaway!!!! I seriously hope I win. Loving your 3 different ways. This dress is gorgeous. Love those blue strappy heels! That is such an adorable dress! Love how you styled it with the denim jacket and boots! You did a great job mixing this up! I love the version with the striped blazer the best, but really the dress is so pretty that it looks good with anything! I love the 3 different ways you styled this dress, they are all so cute! I love the running errands and date night ones, you look so pretty! I love all three of these outfits! I think the date night version is my favorite because I love coral and cobalt. I prefer dresses over separates, so I'm always looking for new accessories to incorporate with my dresses, or new ways to layer other pieces with them. Love the way this dress is styled!! The first is my fav!! Cute, cute, cute! I don't wear heels myself, but those blue strappy sandals are GORGEOUS!!! I love all of the ways you styled this. And that lens...lookin' reeeeealllll nice! I LOVE ALL THREE ways! Such a gorgeous dress and looks great mixed with the striped blazer! Totally in love with the blue strappy heels and pink cardigan! I love how you re mixed this dress! I really like the striped blazer look! What a cute dress! I like all of the ways that you styled it here! Such fun looks! I love the pink cardigan with the dress..so cute! Jessica, you are adorable beyond words! I love all three looks and how they are all so different! You nailed this post! I love all three looks, but #3 is so sweet and fun. The blue heels are awesome! Such cute looks! Obsessed with that dress! The print is too fun! I like all 3 styles! I have never rented clothes before....I am afraid I would fall in love with a piece and don't want to return it. What a beautiful romantic dress, I love the first look but I would wear it with wedges. That dress is the CUTEST! Love love love the ways you styled it...it looks perfect with that striped blazer! That dress is absolutely adorable on you! I love the dress, super cute how you combine it with different outfit! Great dress. I think the date night look is my fave although they are all fabulous. I'd probably try layering a sweater over it. Ms. Mara (at M Loves M) "taught" me that trick and I've been hooked on it ever since! Such a great way to remix dresses IMO. I love how you paired it with the striped jacket. wow that dress is so pretty! 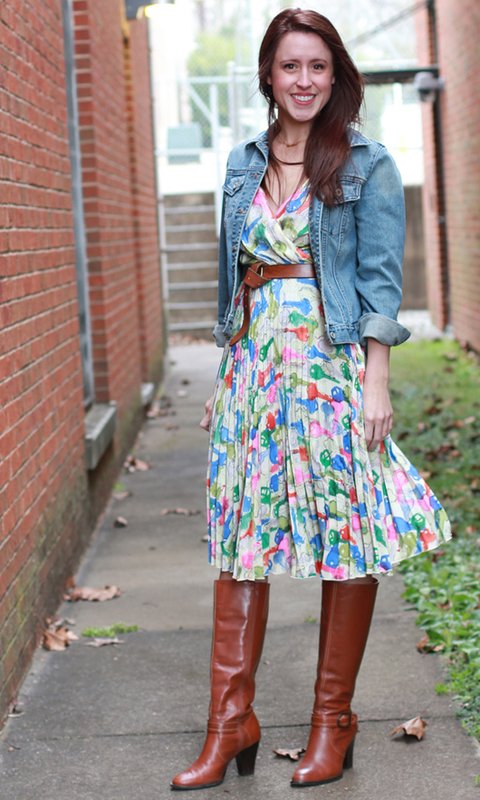 and i just love all three ways you styled it! I love the versatility of the dress! Your date night outfit is gorgeous. Lendperk sounds like a great company! Awesome post. I would wear it with a white cardigan and a colorful hat! where have all the bootcuts gone?